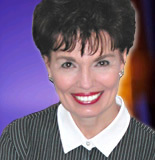 Barbara Wentroble is gifted as a strong apostolic leader with a powerful prophetic anointing. Her pioneering spirit is evident through her apostolic prophetic teaching and impartation that releases God’s purposes. Nations are significantly impacted as Barbara ministers to leaders and churches. She travels extensively conducting leadership conferences with an emphasis on releasing the prophetic and apostolic anointings in cities and regions. With former pastoral experience alongside her husband Dale, Barbara has clarity and understanding of the authority and functioning of the local church. Barbara is President and Founder of Wentroble Christian Ministries. She is also the Founder of International Breakthrough Ministries (IBM), an apostolic network of ministers and churches. Barbara is a member of the Apostolic Council of Prophetic Elders and the International Coalition of Apostles. Dr. Peter C. Wagner is the presiding apostle of these organizations. She serves on the boards of several ministries including the Federation of Ministries and Churches, an international, apostolic network for churches and leaders. She and Dale serve as apostolic leaders of Glory of Zion Outreach in Denton, Texas, where they are members. "What am I seeing? "1 asked the Lord. He told me that each small wave represented a move of His Holy Spirit. Each wave carried a measure of revelation that was higher than the previous move. He then told me that a move of His Spirit was coming that would be greater than all the previous moves of His Spirit with a corresponding measure of revelation. The tsunami of December 2004 reminded me of that vision. Scientists tell us that a tsunami occurs when there is a shift in the plates of the earth. The shift causes an undersea earthquake resulting in a tsunami. Although the vision was given to me many years ago, it is as clear today as it was then. Prior to the tsunami, a shift took place in the plates of the earth. That natural shift represents a spiritual shift that is taking place. Today is a time when the Lord is releasing great revelation concerning His plans for the earth. Part of His plan involves the partnership of men and women to impact the nations of the world. God always planned for men and women to walk in partnership and fulfill His purpose in the earth. The Bible teaches that both man and woman were created in God's image. They both had a direct relationship with God. Both shared together the responsibilities of bearing and rearing children and having dominion over the created order. (Gen. 1:26-28). Men and women were created for full and equal partnership. It was never God's plan to have one gender rule over the other. Jesus always taught that all believers are necessary and beneficial to the Body of Christ. At Pentecost, the Holy Spirit came upon men and women alike. Both were given gifts without discrimination (Acts 2:1-21; 1 Cor. 12:7,11, 14:31). Men and women are called by the Lord to develop and exercise those gifts as good stewards of the grace of God. Although this is the will of God, His will does not always get done. In fact, some respected theologians and reformers throughout history have taught contrary to these principles. You [women] are the devil's gateway; you are the unsealer of that [forbidden] tree; you are the first deserter of the divine law; you are she who persecuted him whom the devil was not vigilant enough to attack. You destroyed so easily God's image, man. On account of your desert [i. e., punishment] that is, death even the Son of God had to die. Not only did theologians teach this doctrine but even "reformers" continued to propagate this doctrine. Men like Martin Luther and John Calvin failed to understand God's entire role for women. They saw women in only a subservient role. Women, from their view, were in the earth to serve in the home, have sexual relations with their husbands and bear children. How sad that the oppression of women has been not only tolerated in the church but has been taught as the will of God! Jesus came to redeem women as well as men. Through faith in Christ, we all become children of God. We are one in Christ, and share as heirs of the blessings of salvation. In Christ, there are no distinctives with reference to racial, social or gender bias (John 1:12-13; Rom. 8:14-17; 2 Cor 5:17; Gal. 3:26-28). Walls of division between men and women are crumbling! During the 1980s, the walls of Eastern Europe started falling in nation after nation. Today, the walls that have kept men and women from walking in full partnership are crumbling. Jesus came to tear down every dividing wall! For He Himself is our peace, who made both groups into one, and broke down the barrier of the dividing wall (Eph. 2:14). Oppression and cruelty toward women is crumbling. God is empowering a new generation of men and women to walk side by side and press into every area of life with great victory. A shift has taken place in the earth. A tsunami of God's Spirit is crumbling every wall that keeps men and women from fulfilling His purpose. Together, men and women are arising in partnership to bring transformation in the nations of the earth!